We have often mentioned how much we enjoy meeting new artists, one of the true joys of running a netlabel. But we enjoy just as much welcoming back artists who have already released with us, and love presenting new works by these folks to our audience. 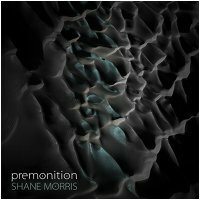 Such is our pleasure today, as we introduce the latest release by ambient multi-instrumentalist Shane Morris, entitled Premonition. Like Shane's previous Earth Mantra title Magnetosphere, Premonition is live music, a recording of a piece Shane performed in real time on March 25, 2010, with no editing or overdubs. Also like his previous release, this album showcases Shane's powerful live performance chops. Listening to the music, one easily forgets that the artist is composing all music and generating all sounds as the music commences. Having witnessed Shane's performances in person, we can attest to his singular talent at delivering majestic and effortless live ambient music. He is truly a master of the art. This performance is no exception. The music drifts along lazily through placid sound worlds, punctuated at careful intervals with shakers, light percussion, and various otherworldly instruments. As always, Shane designs sounds of immaculate beauty, layering and interleaving them in perfect balance, with never so much that it overwhelms, but with never so little that one loses the thread of the piece. We find particularly remarkable how seamlessly the individual components of this work dovetail. One understands, while listening, how deeply Shane understands the ambient form, and how broadly he sees the forest while focusing on the trees. Simply exceptional work. On his web site, Shane lists no influences we can find, but we would hazard a guess that Steve Roach figures prominently among them. To us, this particular recording strongly evokes some of Roach's softer, more enigmatic longform pieces, with all the mystery and delicious abstraction that implies. But this is no mere Roach emulation; Shane's musical voice shines clearly through, an aesthetic that honors the masters that have come before while charting new directions forward. We would go so far as to say that Shane takes up the mantle that Roach has given us and yet guides us to wholly new realms and vistas unique to his own point of view. Astonishing music. So we are truly honored to be bringing the work of Shane Morris to our listeners and could not be more excited to unveil Premonition, Shane's sophomore Earth Mantra title. May it be only the latest of many more releases to come in the future. Highly, highly recommended. Cavernous, catacombs, subterranean worlds, dripping grottoes, vast tunnels of shadowy emptiness . . . well done cinematic found-sound meets alien machine-works on infinite standby mode . . . think Jeff Greinke Cities in Fog mixed with Brannan Lane's Lost Caverns of Thera . . . not for relaxation but better for visualization, inspiration, cerebral voyages . . .
A great dark trip. Darkness and experimentalism at their best, without the cliches of the dark ambient genre. This album manages something quite rare in the ambient genre : includes many changes and surprises inside an overall droney/minimalist structure. Very Nice. Really an outstanding ambient work, full of depth and resonance and lots to keep one interested.